After winning amateur talent contests in New York, the youthful Fitzgerald joined the Chick Webb orchestra in 1935. Webb nurtured the girl’s talent, even becoming Fitzgerald’s legal guardian after the death of her mother. When Webb died in 1939, Fitzgerald led the band until it broke up in 1942. From this point on, Fitzgerald had a solo career that spanned another five decades. Her range as a singer was unparalleled and the lyric mellowness of her voice unequalled. 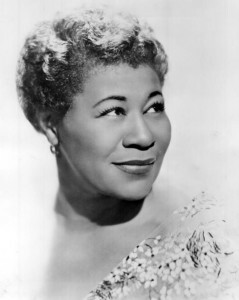 Many critics consider her the greatest female vocalist who ever sang jazz.